In my effort to find easy and healthy snacks for the kids I decided to finally jump on the Kale bandwagon. 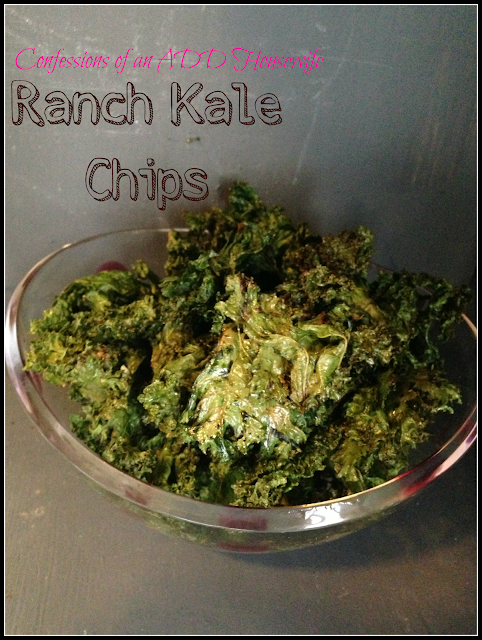 I generally love any type of green leafy veggies, so I was hoping the kale chips would be a big hit. I mean...how bad could oven roasted dried leaves be? Exactly. So I decided to add a homemade ranch powder to actually give them something unhealthy to make them flavorful! I started with a large bunch of kale and pulled the leafy part off the stalk. Since I've never eaten kale before, I felt it was important to try a nibble before going any further. To me, it tasted a bit like broccoli and spinach combined. It wasn't horrible. After pulling off the leaves, I tossed the them in a bit of olive oil. On a flat baking sheet, spread out the kale. This is when I added the ranch powder. I used this recipe but you can also use store bought powder. Next, they baked in a 350 degree oven for about 30 minutes. I moved them around the pan about 15 minutes in.